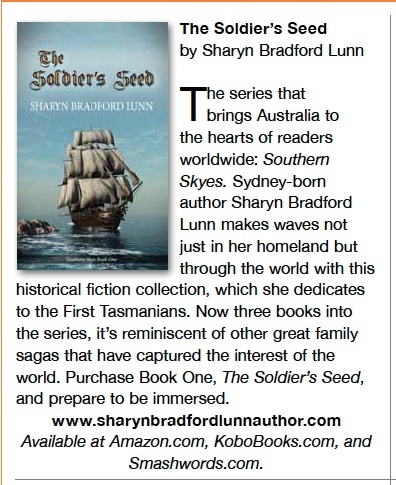 Given that my series, “Southern Skyes”, touches on the culture and demise of the indigenous people of Tasmania (formerly Van Diemen’s Land) I thought it appropriate to look more closely at the history of this noble race. People are believed to have moved into Tasmania across a land bridge between the Australian mainland and the island approximately 40,000 years ago during the last ice age. After the ice melted and sea levels rose, flooding what is now Bass Strait, the people were left isolated for approximately 8,000 years until European exploration reached the area in the late 18th and early 19th centuries. The First Tasmanians had a social and political organisation comparable to hunter/gatherer communities on mainland Australia and possessed as a clear understanding of territory and the land. However, changes in the social, cultural and territorial structures of the Tasmanian people have been largely lost over time. Archaeological evidence indicates that fish were dropped from the diet in preference to land animals around 3500 years ago, but the content of middens around Tasmania’s coastline indicates that they still consumed other forms of seafood including abalones, oysters and mussels in large quantities. At about this time they refined their making of stone implements and stopped using tools made from bone. As a mainly nomadic people, the First Tasmanians followed the seasonal changes in food supply, such as kangaroos, wallabies, seabirds and shellfish as well as a variety of plant foods. Canoes were used during the last 2000 years to travel to islands to harvest mutton birds and seals during summer and autumn. In Tasmanian society it was the band that held the land. They camped in family groups, several of which formed a band. At the time of European contact there were nine language groups, or tribes, and somewhere between six to fifteen bands spoke the same language. Archaeological evidence indicates that the Tasmanians had been expanding their land, possibly by the use of fire to clear forested areas, until the arrival of Europeans. Their population is also thought to have been increasing and at the start of the 19th century it was thought to have been in the range 4,000 to 10,000 people. British settlement in the south of the island in 1803, where Hobart is today, was the start of the destructive interaction of the First Tasmanians with Europeans and within 75 years all full-blood Tasmanians had been wiped out. We will explore why and how this occurred in the next session.